Good sources of vitamin C are fresh fruits and vegetables, especially citrus fruits. It can also be made in a laboratory. There are various benefits of vitamin C to the health, so let’s see amazing health benefits of vitamin C.
Vitamin C can be found in citrus fruits, vegetables, fruit juice. 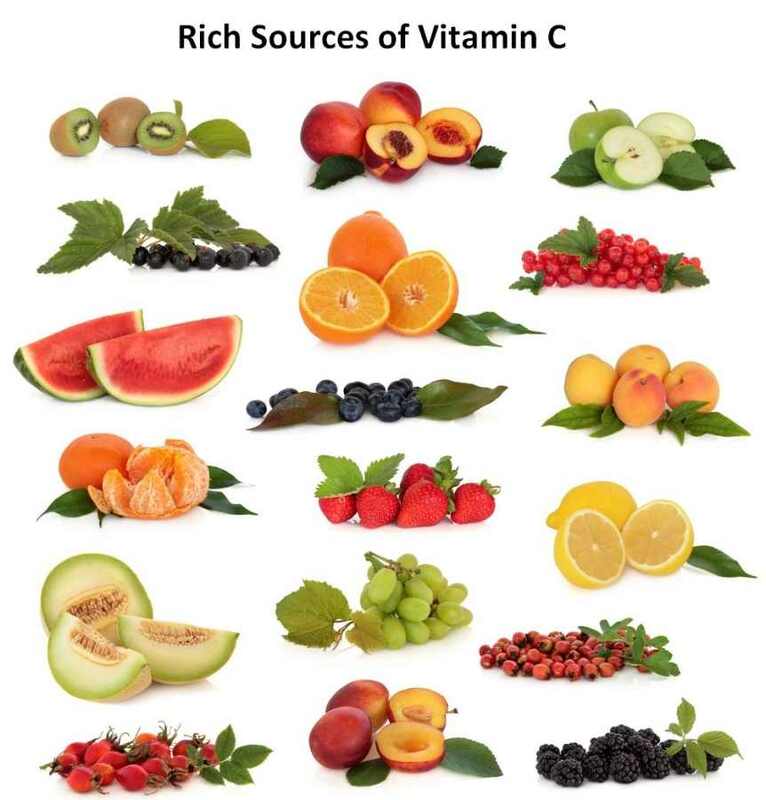 Rich sources of vitamin C include berries, peppers, guava, blackCurrant, kiwi, papaya, kale, parsley, brussels sprouts, grapefruit, peas, oranges, watermelon, strawberries, mango, broccoli, tomatoes, cauliflower, cabbage, and citrus juices or juices fortified with vitamin C. Raw and cooked leafy greens (turnip greens, spinach), red and green peppers, potatoes, green pepper, blueberries, and pineapple are also rich sources of vitamin C.
It has an excellent antioxidant property. It scavenges free radicals that can cause damage to the wall of arteries and increase the risk of heart diseases and Arthritis. It is required for collagen production and helps to reduce pain, inflammation, and swelling of joints in people with arthritis. It also helps in maintaining healthy joints and keeping them flexible. Helps in cure for the growth and repair of tissues in all parts of your body. These days, vitamin C is used most often for preventing and treating the common cold. Protects and fight infections of the bladder, prostate, and acne. Also, for other skin infections, bronchitis, glaucoma, preventing cataracts, preventing gallbladder disease, arthritis, bursitis, back pain, disc swelling, cancer, osteoporosis, asthma, bronchitis, infertility, and diabetes. Some people use vitamin C for depression, thinking problems, dementia, Alzheimer’s disease. Helps the production of collagen, which maintains healthy connective tissues. They are important for the support and structure of organs including the skin, bones and blood vessels. Vitamin C helps protect cells and keep them healthy from the risk of heart diseases. It has an excellent antioxidant and antihistamine, improves the function of the lungs and airways. Uses: In moisturizers, face packs and masks for rendering natural glow to the skin. Vitamin C is helpful in reducing and repair Wounds, healing and facilitates the growth of the connective tissues. Vitamin protein used to make skin, tendons, ligaments, and blood vessels repair and maintain cartilage, bones, and teeth. It protects our bones, helps in building our tissues and is an important factor in the absorption of iron. It is also a very potent antioxidant. Some researchers believe that vitamin C deficiencies in newborn babies can impair mental development. It also helps your body to absorb iron. Try to include a food rich in vitamin C with every meal to get the most iron out of the other foods you eat.